These are convertible lecterns. The lectern crown and special Lift & Roll enabled bases provide expanded utility to LS-512 and LS-512P convertible computer workstation models. 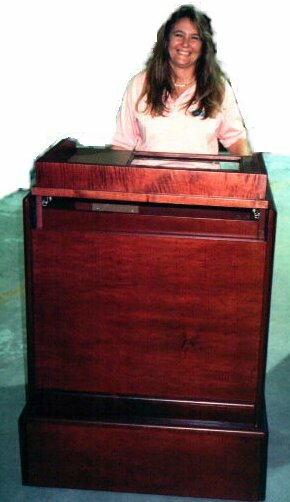 The photo at right is of the LS-512P Lectern. The keyboard and mouse tray as well as the lectern surface and any attached microphones, are adjustable to fit each speaker with just the touch of a switch. On this model the monitor is viewable below-desk, through a viewport. This is Susan. She helps keep everybody organized. Understated, rugged. 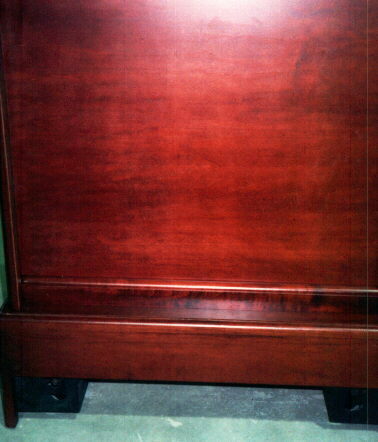 This finish selection will blend well with most color schemes. Like wood versions, this finish also provides a good background for logo addition. These models are designed to instantly convert to standard desk-height versions of their core units on demand. The LS-512P model is shown below, sans its lectern crown and base. Below is the speaker's side of the lectern. Lift & Roll mechanisms can be seen at base. Lecterns can be relocated in-house without the need to remove computer equipment. The lectern rests normally on the floor until mobility is desired. Insert the keyjack and with a flick of the wrist and just 8 pounds of pressure, the Lift & Roll mechanisms are engaged and the unit is up on wheels, ready to roll. The Keyjack that comes with your OFFICE is the one shown at above right. It will be chrome plated. Should you ever misplace your keyjack, below are replacement components. They are readily available from any Home Depot or Auto Supply Store. There are typically two Lift & Roll mechanisms installed on LS-Lectern and Media models. They are accessed at the base of the unit on the lecturer's side of the cabinet. USE ALL Lift & Rolls installed on your unit. Insert the keyjack, push the Lift & Roll (jacking caster) keyjack to the "down" position to elevate the unit. Always push the handle towards the center of the unit when you want to elevate it. Insert the keyjack in the "straight-up" position. Push DOWN until casters LOCK in place. To RAISE the unit, putting it up on its wheels, insert the keyjack into the Lift & Roll opening. The keyjack opening may be concealed from view, behind a removable black or wood cover. Regardless of WHICH Lift & Roll you are about to elevate, Left, or Right ALWAYS press downward with the handle going towards the CENTER of the unit. Press down until you feel it the jacking caster mechanism LOCK IN PLACE. If it seems to require more than 8 pounds of pressure, you may be trying to press downward in the wrong direction. Once the unit has been permanently positioned, you will want to retract the casters so that The OFFICE is lowered into place and the wheels are invisible. When lowering the unit into place, insert the handle of the keyjack so that it is facing the center of the unit. You are going to return it to the straight up, or 12 o'clock position. Exercise caution once casters are unlocked to lower the unit, since the keyjack bar (provided) will move rapidly in the direction that it is being pulled. Return to LS-512, or LS-512P models of The Learning Station or to Site Index.